Cai Xiaoru, one of the youngest billionaires of China, arrived in Sri Lanka yesterday, demonstrating renewed investor confidence in the nation. Widely-acclaimed for his extremely successful judgement on market certainty and large-scale acquisitions to trigger rapid business growth, Xiaoru’s visit is set to result in some large-scale private sector investments in Sri Lanka, especially in the high-tech/innovationsector. 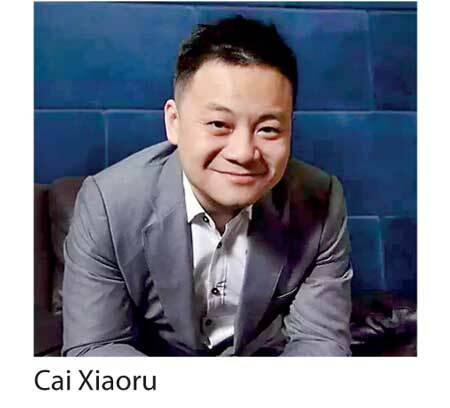 Xiaoru is one of the youngest Chinese billionaires.He is 38 years old and is ranked by Forbes as the seventh youngest billionaire of China. He is the owner and Chairman of Shenzhenlisted public company Tatwah Smartech Co.Ltd. (www.twh.com.cn). Tatwah is the world’s largest manufacturer of RFID tags and owns a mega manufacturing facility employing thousands of people in Zhongshan, China. Xiaoru is now actively investing overseas and has embarked on his maiden visit to Sri Lanka from 9to 13January. Xiaoru’s visit is very significant for China’s private sector as he is the first Chinese billionaire visiting Sri Lanka in recent times to explore investments. Tatwah has a high market position in the domestic Internet of Things industry and is a leading enterprise in the domestic RFID field and a large-scale supplier in this field. Through its accumulated advantages in the field of RFID devices, the company has formed an Internet of Things business system that focuses on hardware manufacturing, system integration, middleware, overall solutions and IoT operations. The company acquired the underlying company JinruiXianxian in November 2015. Its main business is the production of digital TV, internet TV motherboards and internet set-top boxes. Through this acquisition, the company quickly ventured into the OTT business area and further realised the layout in the field of smart life. In order to respond positively to the strategy of ‘Going Global’ and ‘Belt and Road,’ the company actively laid out its overseas markets and started implementing a strategic transformation to international satellite telecommunications operators. In April 2017, the company indirectly acquired Cyprus Star Rail through a subsidiary in Hong Kong, making it the first company in China possessing Kahigh-flux satellite orbit and frequency of the right to use the resources of private enterprises. The company promptly deployed satellite communications operations in various countries along the ‘Silk Road along the Sea’ and rapidlypopularised the innovative business model in China through existing local customer resources and satellite channels globally.